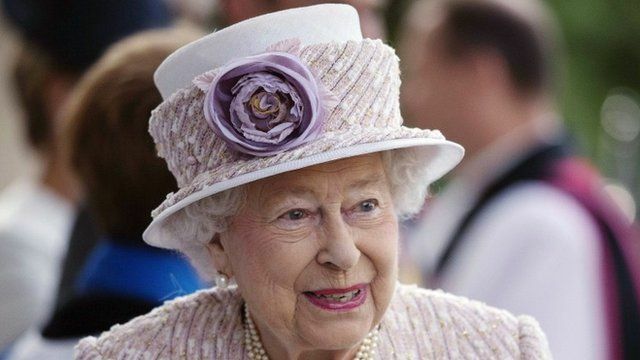 Reflecting on Queen's Commonwealth reign Jump to media player The BBC's Alastair Leithead has been back to Kenya where Princess Elizabeth became Queen in 1952 and his report is followed by stories from other Commonwealth countries. WI on tea and cake with the Queen Jump to media player Members of the Sandringham branch of the Women's Institute, who take tea with the Queen once a year, talk about her visits. 'I was the Queen's first investiture' Jump to media player As the Queen becomes the UK's longest-reigning monarch, one of the first people to be honoured by Her Majesty looks back at the day. 'The Queen is above politics' Jump to media player Sir John Major talks about his impressions of the Queen's reign and her relationships with prime ministers. Rare 'candid' Queen photos released Jump to media player A set of candid photographs of the Queen are being published online as she becomes the longest-reigning British monarch. Royals super-fan turns home into 'shrine' Jump to media player A royal family super-fan says she is very exited that Queen Elizabeth II is set to become Britain's longest-serving monarch on 9 September. New coins to mark Queen's reign Jump to media player The Royal Mint releases commemorative coins depicting the Queen through her reign to mark her becoming the longest reigning monarch in British history. Queen Elizabeth II becomes Britain's longest-reigning monarch later when she passes the record set by her great-great-grandmother Queen Victoria. Princess Elizabeth became Queen while on an official visit to Kenya, while she was staying at the Treetops Hotel when her father, King George the 6th, died in 1952. The BBC's Alastair Leithead has been back to Kenya. Shaimma Khallil remembers her Pakistan tour, Nick Davis is in Jamaica and Phil Mercer reports from Australia.